A girl is assaulted and beaten to death after leaving her mosque on Father's Day. A group of congresspeople is shot at during a baseball practice. A community despairs after a police officer is found not guilty of killing a man during a traffic stop. These are just a few of the brutal events we've experienced as a nation in the past week. 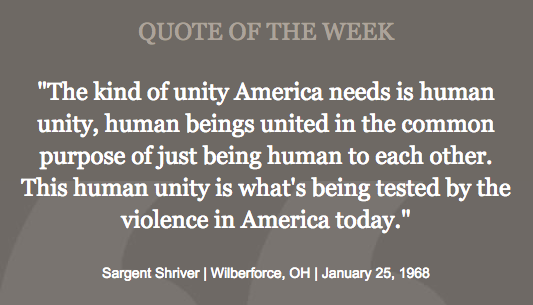 Sargent Shriver understood that until we look past the things that divide us -- religion, politics, race, economics -- and see the things that unite us, we will not end the cycle of violence we are experiencing. Like this quote? Read the speech.